Get a $5 Pre-Paid Holiday Gift Card from Kellogg's! Home » Food & Drink » Get a $5 Pre-Paid Holiday Gift Card from Kellogg’s! Get a $5 Pre-Paid Holiday Gift Card from Kellogg’s! Buy 2 specially-marked boxes of Kellogg’s cereal ON ONE RECEIPT between October 4th, 2018 and January 11th, 2018 and get a $5 pre-paid gift card! Snap a photo of your receipt showing two qualifying purchases and follow the instructions on www.kelloggsholidaycash.ca to upload your receipt for validation before January 25th, 2019. Receive a validation email with a unique link to register your $5 Kellogg’s Holiday prepaid card. 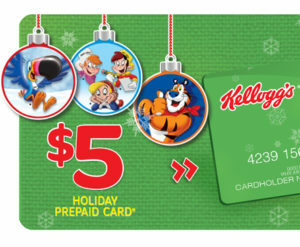 Look for your $5 Kellogg’s Holiday prepaid card to arrive in the mail within 3-4 weeks. FamilyRated – Try New Becel Avo Plus Free!